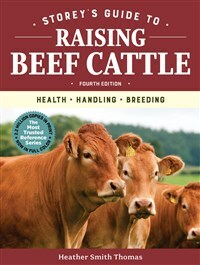 The fourth edition of the most trusted and comprehensive reference on beef cattle health care, breed selection, and grass-fed cattle–raising techniques is now fully revised and updated, featuring color photography and illustration. Heather Smith Thomas has written extensively on animal health care, authoring thousands of articles and 24 books on the subject. Her books include Storey’s Guide to Raising Beef Cattle, Essential Guide to Calving, Getting Started with Beef & Dairy Cattle, The Cattle Health Handbook, The Horse Conformation Handbook, Storey’s Guide to Raising Horses, Storey’s Guide to Training Horses, and Stable Smarts. She raises cattle and horses on her family ranch in Salmon, Idaho.